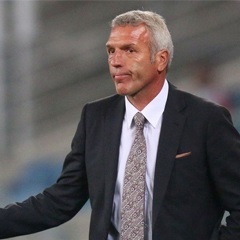 Cape Town - Chippa United head coach Ernst Middendorp is confident that his side will be able to steer clear of the relegation zone this season. The 56-year-old has faced mounting criticism after collecting just two points from their last five Absa Premiership fixtures, with many of the club's supporters calling for him to get sacked following a 3-0 defeat to Sundowns. However, he has seen enough from his team to convince him that they have the required quality to perhaps even challenge for a top-eight berth in the league standings. Despite being just three points clear of the drop zone, Middendorp feels his side is in a "good position". "Mathematically, we are in a good position on the log table at the moment," Middendorp told his club's official website. "We'll have to push more forward for the top-eight brackets position by collecting points in our remaining league games. "The focus is to collect at least full points in our away games or a draw but at home we need all three points on offer. "Of course there is pressure at this stage but I believe in my players. We are going to fight together to stay in the top-flight football next season."